Almost as soon as Constantine had won the battle of the Milvian Bridge and been converted to Christianity, in the winter of 313 AD, he began to get letters from Africa about the Donatists. 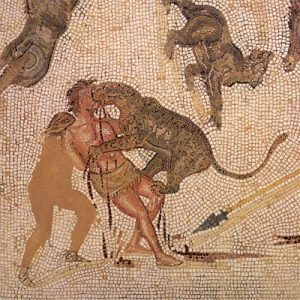 This was a fight between Christians which had started during the Great Persecution of Diocletian. The persecution had been very bad in Africa and many Christians had been killed. Some of the Christians in Africa had not done anything to hide or try to get away from the persecutors, but had stood up bravely for their faith. Others had done little things to try to protect themselves, like handing over copies of the Bible to the persecutors. Now the two sides were fighting. The braver ones wanted to punish the ones who had protected themselves. The ones who had protected themselves thought they hadn’t really done anything wrong. Both sides wanted Constantine to say who was right. 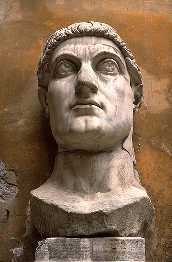 Constantine asked the advice of the Christian bishops at his court, and soon decided in favor of the moderates, the people who had hidden things and handed things over. He thought the other side, the Donatists, sounded like dangerous radicals and not the sort of responsible people you would want to be in charge of anything. But the Donatists appealed his decision. Constantine heard the case again, but again he decided in favor of the moderates. In the end, the moderates won, but the Donatists never gave up fighting. Even Augustine couldn’t stop them. They didn’t stop when the Vandals came, or when the Romans reconquered Africa. The Donatists were still trying to push the moderates out in the 670s AD when the Arabs conquered North Africa. But then when everyone converted to Islam, that was pretty much the end of the Donatists. Cite this page: Carr, K.E. Donatists – Christianity – history of religion. Quatr.us Study Guides, August 21, 2017. Web. April 23, 2019.